NIL28 was founded in 2011 by a number of creative professionals and studios sharing the same neighbourhood and willing to put their expertise to the service of local inhabitants. Their first ‘creative intervention’ occurred during the Milan Design Week 2011: it was named ‘Neighbourhood’s sitting’ and it consisted of a long convivial table (120 metres) and all the neighbours were invited to bring a chair to participate. This intervention was quite provocative: it represented an alternative and more ‘local’ proposal to the official system of events of the Design Week. After this first launching event, NIL28 started to conceive a set of interventions to improve the surrounding public space: to transform the local weekly market in a ‘neighbourhood living room’, to launch a workshop for teaching how to fix/reuse objects, to initiate guerrilla gardening actions on abandoned flowerbeds, to create an information totem about neighbourhood activities for elderly people that are not able to do not use the internet, etc. Besides these ‘small actions’ they organize bigger events, especially in relation to other public programmes. During the Milan Design Week 2012, NIL28 organized the re-design of Einstein street, transforming it into a collective street exhibition, aiming at establishing connections and relations among citizens. 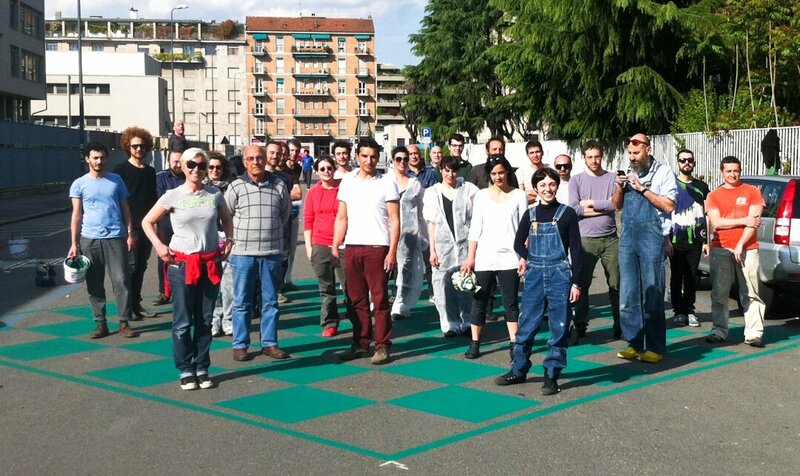 Currently NIL28 is working on a series of events to be connected to EXPO Milano 2015: members created a collective programme devoted to transform their neighbourhood in a more sustainable urban area both from an environmental and social point of view. The key-actors of NIL28 are its founders, a combination of free-lance professionals and creative studio. They are: Sergio Colantuoni (‘lifestyler’, designer, journalist experienced in fashion and art), Controprogetto (a lab that designs and realizes furniture, interiors, exhibitions and public spaces using recycled materials), Dotdotdot (a multidisciplinary design studio that combines art, architecture, construction and design contaminating them with new technologies and new media), Grammatiche metropolitane (a critical observatory on the city), Metrogramma (an urban planning studio), CameraZimma Architetti ( an office of architecture). The majority of the founders of NIL28 share the same working space, a building in Tertulliano street and few years ago they decided to design some interventions on the neighbourhood in order to activate local inhabitants. Besides the founders, NIL28 counts other 30 members among artists, designers, architects, makers and artisans, all of them working and operating in the same neighbourhood. The beneficiaries of NIL28 actions are essentially ordinary citizens living in the area between Tertulliano and Molise street, who can enjoy an alternative cultural offer organized by the members of the association. The role of design within the projects of NIL28 is quite explicit: all the founders deal in some way with design, architecture and art, they are creative professionals and they consciously decide to put their expertise to the service of citizens. They aim at organizing actual cultural events, designing every detail: people from Controprogetto, for example, are interior and product designers and they are in charge to create street furniture, monuments, every ‘physical’ object that is necessary to the interventions of NIL28. Dotdotdot is a studio composed of interaction designers, they contribute not only in conceiving the events but also in designing performances and participatory actions, Sergio Colantuoni, who is also an art director and journalist, leads all the activities related to communication and dissemination. All the founders contribute in general in developing concepts: in a way they are similar to as sort of contemporary avant-garde, because they are all ‘intellectuals’ and they also created a ‘manifesto’ with their philosophy, explaining their purpose to tackle local social issues by means of culture and aesthetics. What is interesting in their design actions is the will to interact with the local community, to design for them and with them, because citizens can benefit from their contribution more than their clients (as private companies or agencies).